Renowned thoracic surgeon Dr. Wickii Vigneswaran left the Loyola University Health System 10 years ago to help start the lung transplant program at nearby University of Chicago Medical Center. He returned to Loyola this year to direct a mesothelioma specialty center, bringing his decade of experience from one of the country’s finest research facilities. 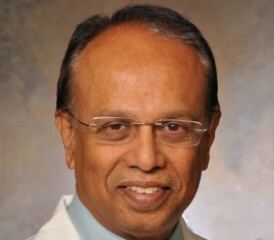 Vigneswaran performed more than 200 surgeries for mesothelioma patients, along with the lung transplants, during his 10 years at the Chicago Medical Center. He did the aggressive extrapleural pneumonectomy (EPP) and the lung sparing but more detailed pleurectomy/decortication (P/D) surgeries. He earned his reputation there as one of America’s finest mesothelioma specialists. He returned to the Loyola School of Medicine as professor and chief of thoracic and cardiovascular surgery, starting the new year at his old place of employment. With more than two decades of surgery experience, Vigneswaran has been part of several, much-chronicled studies in recent years. He is a national leader in the growing belief that age should not be a deterrent to aggressive, possibly curative surgery for mesothelioma. Through his surgeries at UC, he discovered that advanced age of patients did not translate into higher mortality rates or shorter long-term survival periods, dispelling a myth that had dominated the way patients were handled previously. He was part of the first study that measured how P/D surgery decreased pulmonary function with early-stage mesothelioma but preserved pulmonary function and improved quality of life for mesothelioma patients with advanced disease. In joining the Loyola Health System, he will be part of the Cardinal Bernardin Cancer Center, which is nationally recognized for its multidisciplinary approach and collaboration between health care providers. The Loyola Medical Center is just a part of the main health center campus that includes the Stritch School of Medicine, the Loyola outpatient clinic, the cancer center and a 250-bed hospital. Vigneswaran also will be involved at the nearby Loyola-affiliated Edward Hines, Jr. VA Hospital, which will give veterans diagnosed with mesothelioma access to his experience and the specialty care that is critical with a rare disease. He also will return to Loyola’s highly touted thoracic transplant team, which made national news in 2014 when its staff performed five lung transplants in a 24-hour period. It was a herculean effort rarely duplicated anywhere in the world. Vigneswaran said that although advances were made in the last decade with mesothelioma care, he expects even more progress in the next 10 years, much of it coming through more precise therapies, including immunotherapy and gene therapy.